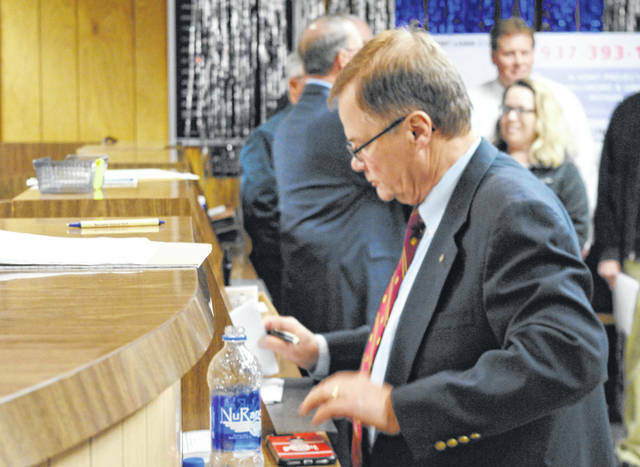 Judge Rocky Coss keeps the books at the 2019 Ernie Blankenship Radio-Telethon for the benefit of the Highland County Society for Children and Adults. The final total of funds raised at the 2019 Ernie Blankenship Radio-Telethon benefiting the Highland County Society for Children and Adults two weeks ago was $101,518, an event coordinator said. Judge Rocky Coss, the local Rotarian who runs the event, said he was “very happy” with the result of the annual benefit. This year’s total came in a little under $1,000 less than the 2018 event, according to Coss. As previously reported, the 2018 edition raised $102,397, which far exceeded the $96,328 raised in 2017. The first-ever radio-telethon for the society in 1973 raised $1,715. The event’s best years were a three-year span from 2006-08 when more than $200,000 was raised annually. The closure of DHL in Wilmington and the overall financial crisis in 2008-09 had a noticeable impact on support for the radio-telethon. Coss on Monday expressed his gratitude to the community for its support of the event. The judge also said coordinators are looking into online donation avenues for next year’s event. “We’re still trying to figure out a way to do that,” he said. The Highland County Society for Children and Adults, funded largely by the telethon, assists Highland County residents with medical expenses, including helping pay for prescriptions, purchasing medical equipment, providing transportation, or even building wheelchair ramps. The radio-telethon is a major annual project of the Rotary Clubs of Hillsboro and Greenfield.